Globalive co-founder and Next Canada board member Tony Lacavera reveals the founding partners for the startup-funding non-profit's latest venture, NextAI, on Jan. 25. TORONTO – Tony Lacavera is putting his money where his mouth is. The former Wind Mobile CEO, who sits on the board of startup-funding charity Next Canada, and whose venture capital firm Globalive Communications Corp. is one of its leading financial backers, served as master of ceremonies on Wednesday as Next Canada revealed the funding partners behind its latest initiative, NextAI. Lacavera framed the new artificial intelligence (AI) startup funding program, which so far has received $5.15 million in financial support from a series of high-profile donors including Royal Bank of Canada (RBC), auto parts giant Magna International Inc., and Scotiabank, as the private sector’s contribution to such AI-friendly government- and education-backed organizations as the Canadian Institute for Advanced Research (CIFAR) and the Natural Sciences and Engineering Research Council of Canada (NSERC), which he said had provided Canada with a “small but fleeting competitive advantage” in the field. In an interview last year with IT World Canada sister site ITBusiness.ca, Lacavera argued that the federal government’s much-vaunted “innovation agenda” would only succeed if the private, public, and education sectors worked together while focusing on sectors in which Canada could excel – including AI. As the name implies, NextAI will provide each of its first cohort’s participants with up to $200,000 in funding, access to state-of-the-art technology, mentorship from business leaders and scientists, and education from some of the field’s top academics, including experts from Harvard, MIT, NYU, the University of Guelph, and the University of Toronto. Their goal: to create commercially-viable AI companies – and help solidify Canada’s reputation as a global leader in the field. “Artificial intelligence means a lot of different things to a lot of people, but whether it’s advanced robotics, whether it’s being able to analyze data and apply it to a solution like a human – which is what we’re looking for in autonomous driving – AI has a lot of applications,” Magna CEO Don Walker told IT World Canada. 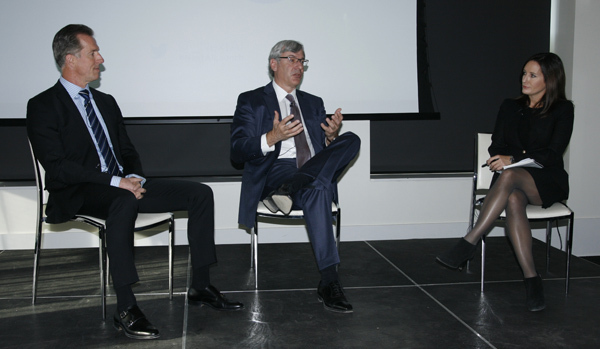 From left: Magna CEO Don Walker and RBC President and CEO Dave McKay discuss the advantages AI holds for Canada’s economy with moderator Amanda Lang during a NextAI event on Jan. 25. During a panel titled “A CEO’s Perspective,” Walker said that Magna, despite being viewed as a manufacturing company, is as much in the software business as the automotive business. During the same panel, RBC President and CEO Dave McKay called AI a “fundamental” tool that Canada needs to harness in every industry it can if it wants to remain competitive into the 21st century. While the program itself is based in Toronto, NextAI is open to entrepreneurs and AI talent from around the world, with Lacavera noting that the first cohort’s 75 participants collectively represent more than 20 different countries, including Germany, India, Israel, Italy, and the U.S. The program was developed last summer during an innovation brainstorming session sponsored by RBC and Magna, both of whom are serving as founding corporate partners along with BDC Capital and Scotiabank. NextAI’s organizers have also formed technology sponsorships with IBM Canada, Google Inc., and Nvidia, which all contributed millions in hardware and services, and will provide participants with funding, corporate mentorship, and access to industry experts, customer trials, and data sets. During another panel, titled “Investing in Canada,” Scotiabank executive vice president and co-head of IT and enterprise technology Michael Zerbs noted that Canada’s present AI ecosystem is stronger than many in the tech industry give it credit for. “We should be less Canadian,” moderator Amanda Lang said.